The boundary between what (goods and services) is possible to produce with the limited available resource and that combination of goods which is not able to be produced with those resources (factors of production - capital, land, labour and entrepreneurship) at the current time with the current state of technology. These inputs to the production process (capital, land, labour and entrepreneurship) are the traditional (and not so traditional in the form of entrepreneurship that encompass ALL things used in the production process - they are scarce in the sense that some effort/value needs to be expended in order to transform and combine them in such a way that they are more valuable in meeting the more or less unlimited needs that people have to sustain life and in the pursuit of their happiness. In order to illustrate this scarcity we imagine the production of only two products by a production unit (this could be a person, a farm or factory or even a country). For illustration purposes we choose barrels of BEER and baskets of BREAD. If all of the country's resources were applied to the production of bread 100 baskets of bread could be produced, nothing more (ceteris paribus). However if all of the same resources were allocated to the production of beer, 80 barrels of beer could be produced. This indicates the effect of scarcity - nothing more could be produced of each product because of the limitations placed by the scarcity of resources. Also, if the country would want to choose to produce a combination of these products, the production of the one product will have to be sacrificed in order to produce the other product. For example, if 40 baskets of bread is produced, at least 10 barrels of beer would have to be sacrificed (given up). This amount that is not produced is called the opportunity cost - the cost that needs to be incurred (that which is given up) to allow the production of bread. (This reality led to the acronym TANSTAAFL - There ain't no such thing as a free lunch). The point 90 barrels of beer and 40 baskets of bread is again a production possibilities frontier. More of either can be produced without sacrificing some of the other. 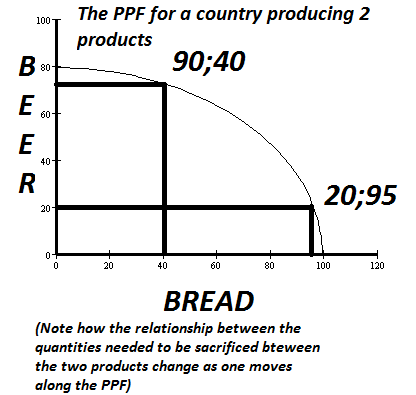 What is interesting to note is that if even bread is required an even larger sacrifice of beer is required - which means that the bread is becoming more "expensive" - towards the bottom right hand side of the graph an enormous sacrifice of bread is required to achieve a relatively small increase in the production of bread. The opportunity cost has escalated. The reason for this phenomenon will be discussed elsewhere - more advanced learners may want to explore the concept of the marginal rate of transformation (start with the Wikipedia article on the subject) Also look at article 145 in this section. What is important to note is that the reverse argument follows the same pattern. 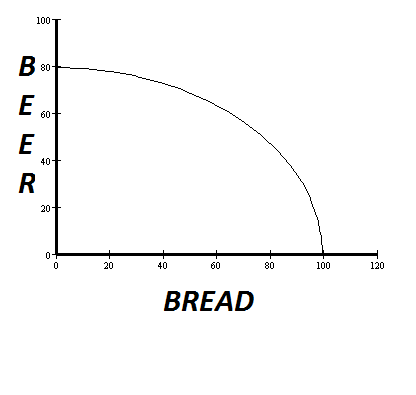 For every increase in the beer production one would have to sacrifice bread. In the beginning what you give up in bread for relatively large quantities of beer is small, but the opportunity increases as one moves up along the PPF. All points on the PPF indicates full productive efficiency. 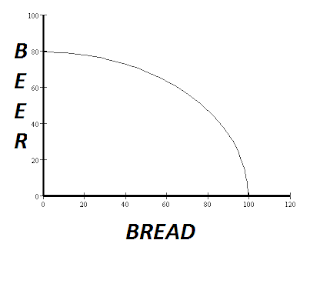 There is however one point where the there is not a maximal use of resources, but an optimal use of resources in relation to cost - that is where the marginal cost of the bread is equal the marginal cost of the beer (where the cost of producing the next unit of beer equals the cost of producing the next unit of bread - this point is called the point of allocative efficiency - also called Pareto efficiency (this excludes the value of the produced units - this concept too will be explored elsewhere). An outward shift of the PPF results from growth of the availability of inputs, such as physical capital or labour or technological progress in knowledge of how to transform inputs into outputs. Such a shift reflects economic growth of an economy already operating at its full productivity (on the PPF), which means that more of both outputs can be produced during the specified period of time without sacrificing the output of either good. Conversely, the PPF will shift inward if the labor force shrinks, the supply of raw materials is depleted, or a natural disaster decreases the stock of physical capital. So to summarise: Scarcity is illustrated by the fact that there is an are outside the PPF that is unattainable and e efficiency level - on the PPF the productively efficient level means that to produce more of one product one has to sacrifice the production of the other product. Below that level - the points beneath the curve indicates inefficiency. So points on the frontier indicates efficient use of the available inputs; and there choice needs to be exercised when deciding the quantities to be produced. 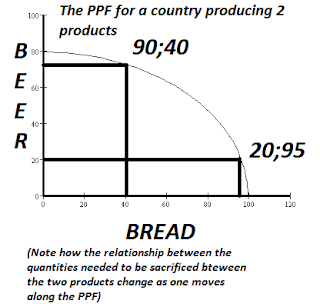 Items need to be forgone of one product in the production of the other product can be viewed as the opportunity cost and the relationship of these change along the PPF - the one product becomes more expensive in relation to the other - this leads to one point on the PPF where the use of resources are optimised.